The Class Roll report displays information for students enrolled in a selected class or classes and is generally used when taking class attendance manually, when the Staff Portal Attendance feature is not being used. The report can be generated using the Class Roll button in the Class record for an individual class, or from the Classes menu where you can use search criteria to select a group of classes to run the report for. Display settings allow you to choose which student and family information you want included on the rolls, for example, allergies and special needs and absence and makeup information (if your database is set to track absences). The rolls can be generated in several formats including: PDF, Excel, HTML, Word, Text, and Tiff. If you choose PDF as the display format, and the report window does not open, turn off popup blocker software. If the report window still does not open, hold down your CTRL key while clicking on the 'Submit' button until the report window opens. Notes that are entered on a Student record > Misc tab, in the Notes field will display on the Class Rolls report; there is not an option to hide them. 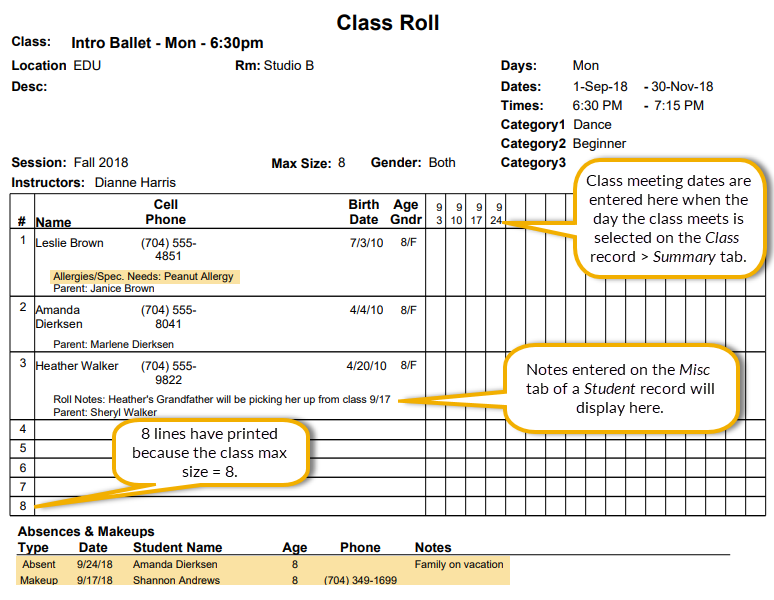 In order to have the class dates completed on the Class Roll, the class must have the day(s) the class meets selected on the Summary tab of the Class record. Currently the only skills that can be included on the Class Roll are Legacy Skills.